How cost effective are the teams the players come up with. How much damage can a team deal in one turn or throughout one run on the isle..
How many turns does it take to clear the isle. Each ranking mission can have one or more of these criteria applied at the same time. 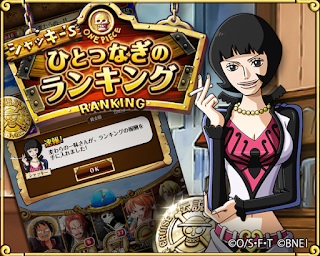 Remember each fortnight isle will have a different criteria so don't expect to score high points with the same team in each ranking mission. Bronze medal- gives you' a certain amount of beli. Another important thing. Don't be under the impression that u will be getting the rewards based on your ranking with your friends. Q: How often can we get these rewards? Q: After getting Silver Medal i can not get Gold , Platin? Q: Is there some kind of reset for rewards? Q: Will we get more rankings? Q: Different requirements/missions for the same fortnight? Q: Can we get multiple rewards with one playthrough? Q: My friends have abnormal points which seems surreal? A: Yepp. Those are hackers and you should distance yourself from them. Q: When will come the next fortnight with rankings? A: Only global versions' Bandai knows. They will first announce it, but later the rankings just happen to be there. Q: Will the prizes always be the same? A: The color of turtles and cotton candy type will be different but in the same order as before. Q: Does our bounty carry over or do we have to start from zero on next ranking?